A federal grand jury in St. Paul, Minnesota, has charged a man in connection with a plan to illegally export North American box turtles to Hong Kong. The indictment, based on a U.S. Fish & Wildlife Service investigation, accuses Rene Vargas of illegally shipping 38 box turtles in packages falsely marked as “toys” or “components” last year. However, the feds are unusually closed-lipped about the case despite announcing the felony indictment in a publicity-seeking press release. Neither the press release nor the indictment discloses where the turtles came from, whether they actually left the U.S., the condition of their health or where they are now. Neither a public affairs officer for the U.S. Attorney’s Office, Tasha Zerna, nor a public affairs officer for the Fish & Wildlife Service, Tina Shaw, would provide any details. What is known is that box turtles are “in decline due to loss of habitat and illegal trade, including export to Hong Kong and China for use in food, traditional medicine and to be kept as pets,” the U.S. Attorney’s Office said in its press statement. The species lives throughout the Eastern U.S. as far west as Michigan, and in Mexico, but it’s not found in the wild in Minnesota, according to Richard Baker, the state endangered species coordinator in the Minnesota Department of Natural Resources. Baker said the DNR wasn’t involved in the investigation. He speculated that the turtles may have been discovered at the Minneapolis-St. Paul International Airport, where the Fish & Wildlife Service maintains an office. 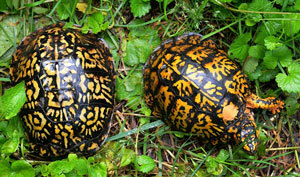 Box turtles are covered by the Convention on International Trade in Endangered Species of Wild Fauna and Flora, according to the indictment. That international treaty protects species that don’t currently face extinction but could go extinct without trade controls. Federal law makes it illegal to export wildlife “without prior approval from and inspection by the Fish & Wildlife Service and proper documentation,” the indictment said. Federal law also requires an export permit. Vargas, who lives in St. Paul, is charged with deliberately providing false information on international shipping forms for three packages. The first was on a June 1, 2017, package containing 10 turtles but mislabeled as “toys.” The other two were on June 14, 2017, packages labeled as containing “components” but actually containing 12 turtles and 16 turtles. A false labeling violation carries a maximum possible sentence on conviction of five years in prison and a $250,000 fine, Zerna said. Court records show Vargas is scheduled to appear in court Wednesday, Aug. 22, in front of U.S. Magistrate Judge Hildy Bowbeer. No defense lawyer appears in the court file.